Grand Procession celebrates Native identity through 23 colorful and meticulously detailed objects that are much more than dolls. 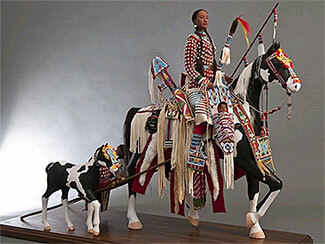 Traditionally made by female relatives using buffalo hair, hide, porcupine quills, and shells, such figures have long served as both toys and teaching tools for American Indian communities. Outfitted in intricate regalia, these dolls represent Plains and Plateau tribes and the work of five artists: Rhonda Holy Bear (Cheyenne River Lakota), Joyce Growing Thunder (Assiniboine/Sioux), Juanita Growing Thunder Fogarty (Assiniboine/Sioux), Jessa Rae Growing Thunder (Assiniboine/Sioux), and Jamie Okuma (Luiseño and Shoshone-Bannock). Their superb craftsmanship and attention to detail imbue these figures with a remarkable presence and power, turning a centuries-old tradition into a contemporary art form. Objects on loan from the Charles and Valerie Diker Collection.